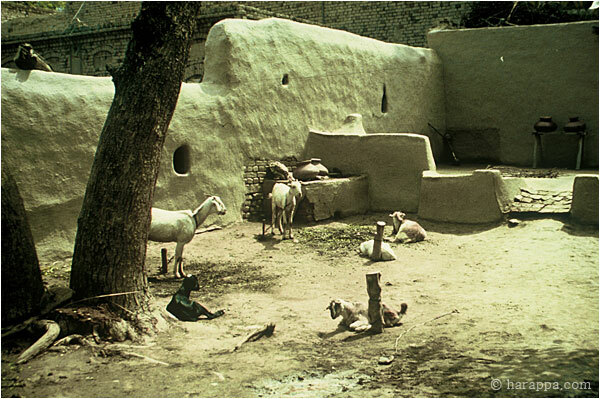 This courtyard of a modern house in Harappa town, has an upper level in front of the house that is plastered and has a small entryway that can be blocked to keep out animals. Drinking water is kept in earthenware pots on a wooden stand. The lower level of the courtyard is shaded by a large jujube fruit tree. Goats are tethered in the shade of the tree. In corner is an old oven (tandoor) being used as a shelf to hold water pots. Niches in the wall are used to hold lamps at night.